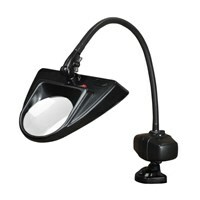 This LED illuminating magnifying lamp has a flexible gooseneck arm that is easy to maneuver, has limitless positioning options and rugged construction that won't sway, sag or break, and stays in position where you place it. Almond color matches any decor. 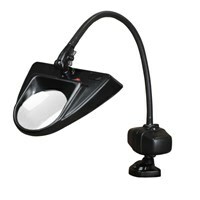 Clamps fit up to 2.5 thickness, allowing this diverse magnifying lamp to be used almost anywhere. Magnifier features 5-diopter glass lens that is five inches in diameter, and magnifies an object 2.25x when it is held at a distance of 5-8 below the lens. 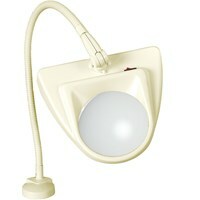 13-watt energy efficient bulb has 220 foot-candles of illumination and operates up to 10,000 hours. 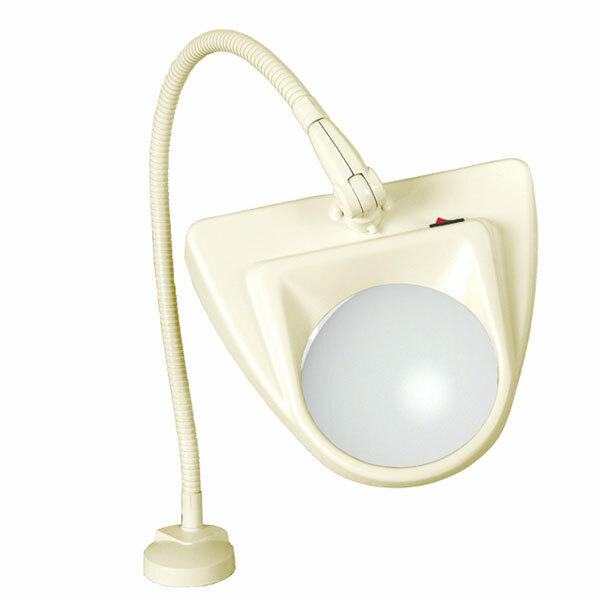 Low bulb temperature is comfortable to work under for extended periods. Since the light source is located behind the magnifying lens, the light is cast at an angle of incidence ideal for highlighting object details. This shadow highlighting makes details of uneven surfaces pop-out to the viewer and is well suited for many inspection tasks. 5-year warranty.